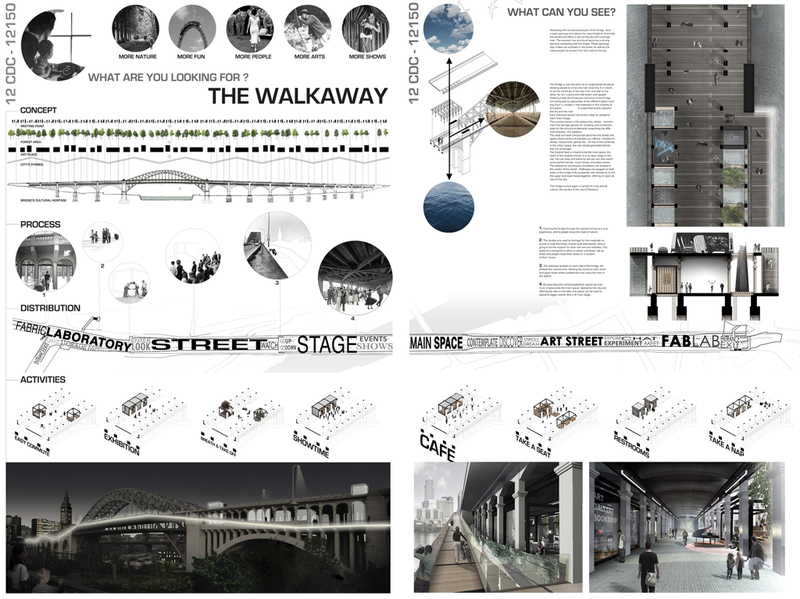 Overview: THE WALKAWAY Bridge is not only seen as an engeneered structure allowing people to cross the river anymore. It is meant to be the continuity of the city, from one side to the other, for art, culture and interaction with people. 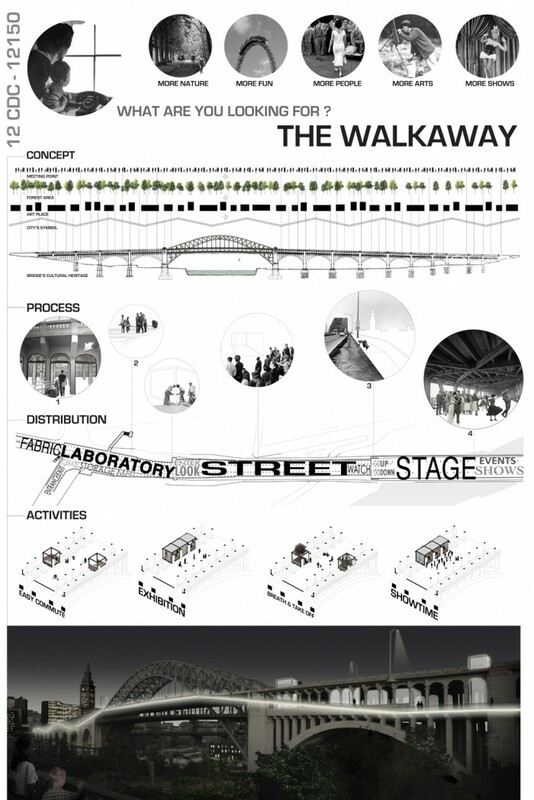 Walking inside the three-part structure of the bridge and being able to appreciate all the different lights resulting from it, creates a new extension in the urbanity of the spaceÊ: A suspended street, between the sky and the river. Each individual section becomes a step for people to claim their bridge. 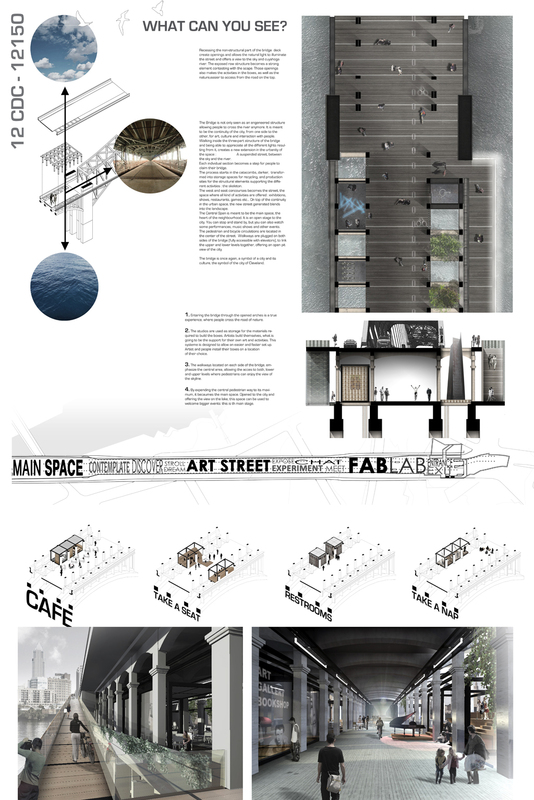 The process starts in the catacombs, darker, transformed into storage spaces for recycling, and production sites for the structural elements supporting the different activitiesÊ: the skeleton. The west and east concourses becomes the street, the space where all kind of activities are offeredÊ: exhibitions, shows, restaurants, games etcÉ On top of the continuity in the urban space, the new street generated blends into the landscape. The Central Span is meant to be the main space, the heart of the neighbourhood. It is an open stage to the city. You can stop and stand by, but you can also watch some performances, music shows and other events. The pedestrian and bicycle circulations are located in the center of the street. Walkways are plugged on both sides of the bridge (fully accessible with elevators), to link the upper and lower levels together, offering an open pit view of the city. The bridge is once again, a symbol of a city and its culture, the symbol of the city of Cleveland.